1. 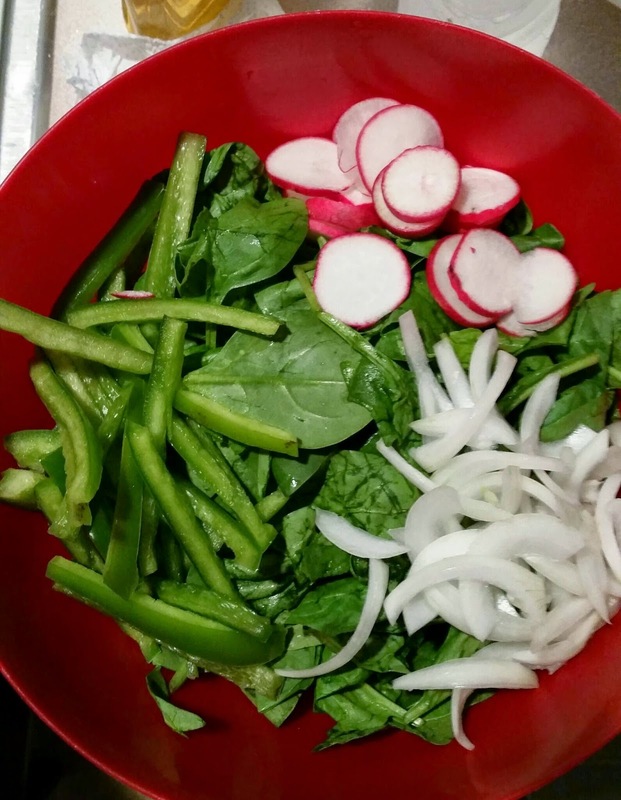 Thoroughly wash baby Spinach, radishes, and green pepper. 2. Dice 1 medium onion. Put to the side. 3. Dice 3 to 4 garlic cloves. Put to the side. 4. Slice the second medium onions into thin layers. Put to the side. 5. Slice the green peppers into thin layers. Put to the side. 6. 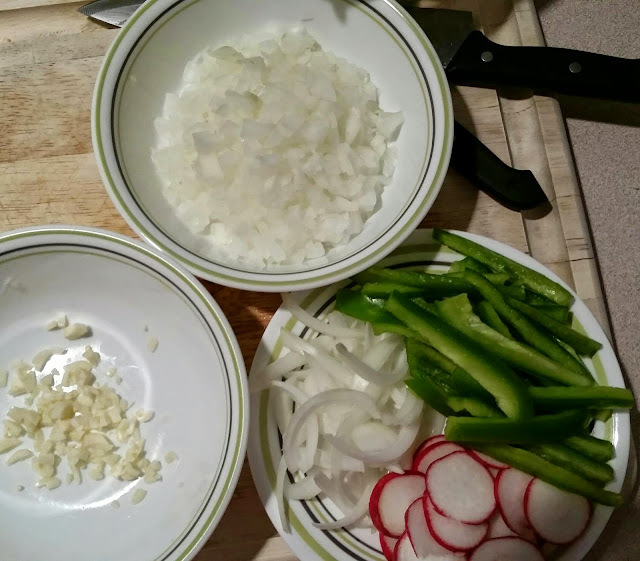 Slice radishes into thin circles. Put to the side. 7. Combine Baby Spinach, Onion, green pepper, and radishes into a bowl. Put to the side. 1. Remove chicken breasts from package. 2. Under cold water, clean chicken breasts with vinegar. 3. 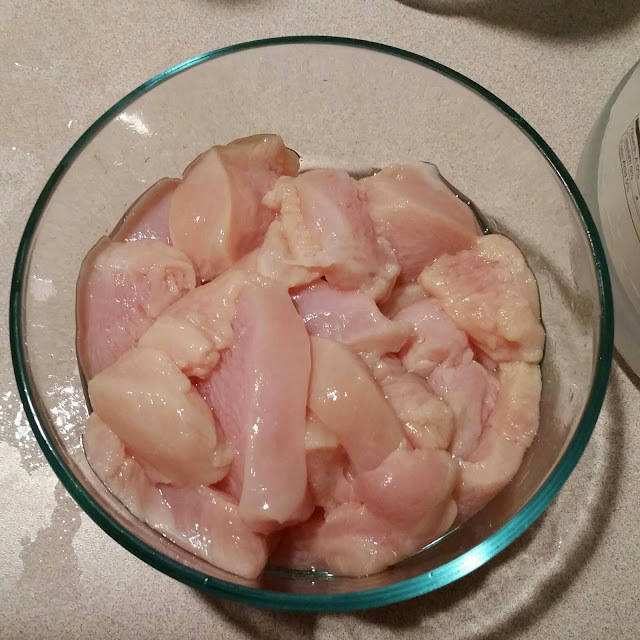 Remove fat from the chicken (white pieces). 4. 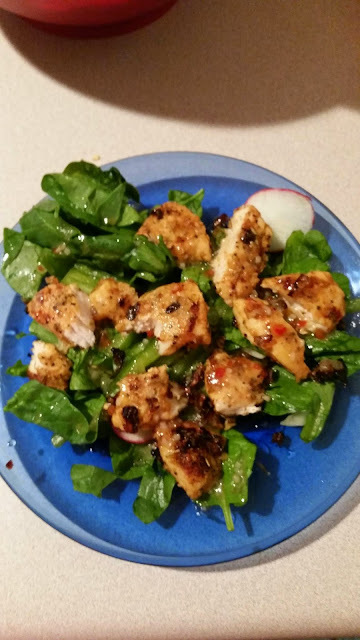 Cut chicken breasts into bite size shapes. 5. Put chopped pieces into a glass container with cold water, ice cubes, and a little of vinegar. 6. Rinse the chopped pieces after about 5 to 7 minutes. 7. 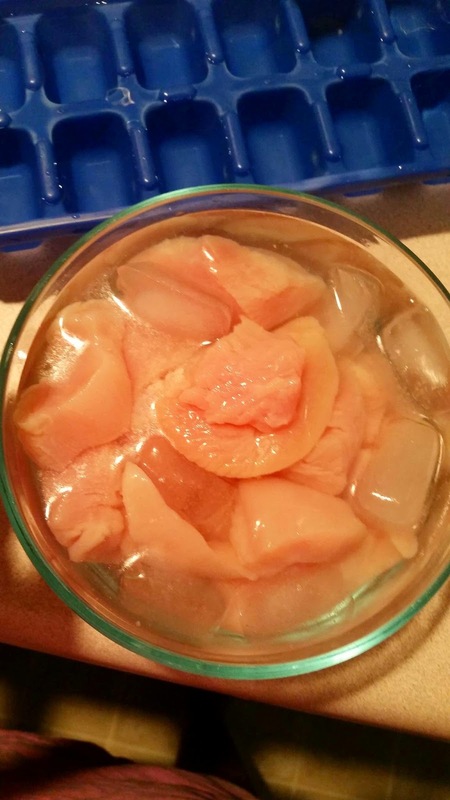 Place chicken pieces onto a plate. Poke chopped pieces with a fork (helps the chicken absorb seasoning). 8. Add seasoning to your liking. I only used one: Spicy Chicken ~N~ Kickin’ Spice. 1. On medium heat, put a teaspoon of coconut oil into a medium/large skillet. 2. Sprinkle a few pinches of the diced onion and garlic into the skillet. 3. Stir onion and garlic until golden-brown. 4. Add chopped chicken pieces into the skillet. 5. Place a pot top over the chicken, onion, and garlic. 6. Allow to cook 3 to 5 minutes on each side. (For beginners: cut the middle of the chicken to check if it is done). *If skillet is big enough for all of the pieces of chicken, then put all of the diced onion and garlic cloves in step 2 of cooking instructions. On a plate, place salad part first. Place chicken pieces on top. Add whatever dressing you would like (I used zesty Italian Dressing). ENJOY!